This photograph shows Jonathan Priestley, father of the writer J.B. Priestley, serving school dinners to children at the White Abbey Dining Room, Bradford, in 1907. Jonathan was Headmaster of Green Lane School, which hosted a new central depot which made meals for children across the city. The First School-Feeding. Jonathan Priestley, father of the writer J.B. Priestley, serving school dinners to children at the White Abbey Dining Room, Bradford, in 1907. Copyright holder unknown. The introduction of “school-feeding” is an example of Bradford innovation in social welfare. From its earliest days as a booming wool town through the 1890s and 1900s, the fast-growing city saw great poverty among its industrial workers and their families. It became a centre of radical ideas and practice in alleviating these conditions, often strongly influenced by Nonconformism: social obligations and the value of education. Witness the fight of Oastler and Forster against “Yorkshire slavery”- cruel conditions in factories – and later the Manningham Mills strike, which led to the founding of the Independent Labour Party (ILP). The photograph is taken from Socialism over Sixty Years: the life of Jowett of Bradford, by Fenner Brockway (Allen and Unwin for the National Labour Press, 1946). Frederick William “Fred” Jowett (1864-1944) was instrumental in the founding of the ILP and was a pioneer of “municipal socialism” to improve the lives of working people. Jowett served on Bradford Town and City Councils and later became an MP. J.B. Priestley, by then perhaps the city’s most famous son, wrote the Preface to Brockway’s book. JBP did not agree with Jowett and the ILP on all issues, but he paid tribute to Jowett’s integrity and what he and they had achieved for poor people. “School-feeding” was one of these achievements. The city’s workers suffered in the 1890s and 1900s as the wool trade declined. ILP activist Margaret McMillan, elected to the Bradford School Board with a mandate to fight “the battle of the slum child”, saw from medical inspections that children were under-nourished and that this was the most serious health concern in the city. It led to listlessness, disease, and meant children could not benefit from their education. However, schools were powerless to help. Charities such as the Cinderella Club could not feed all who needed assistance and the Guardians of the Poor Law provided inadequate meals mocked by activists as “bun, banana and beverage”. The Council finally agreed to supply school meals in 1904, after many years of campaigning by Jowett and others, and despite stiff opposition (McMillan had left Bradford by that time, following the abolition of School Boards). Bradford was the first Council to offer this service. The Provision of Meals Act was passed in 1906 in Parliament, Jowett, who had by then been elected member for Bradford West, speaking in favour. 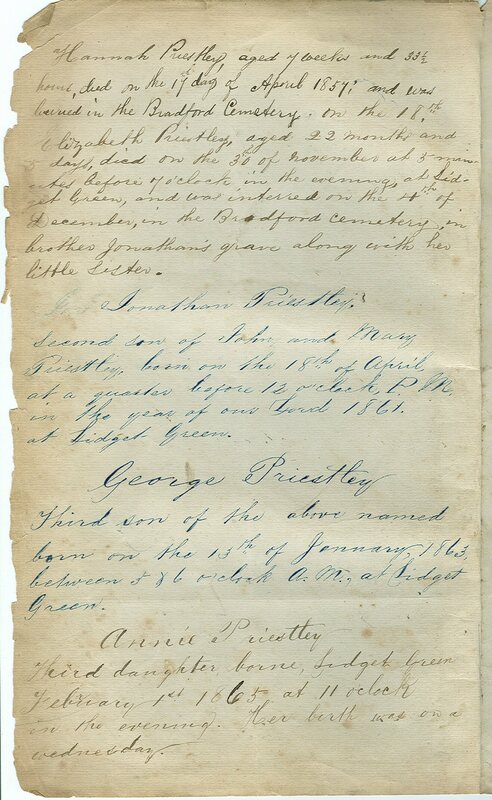 Page from the “Priestley Family Register”, kept by J.B. Priestley’s grandfather John, and showing the birth of his father Jonathan. 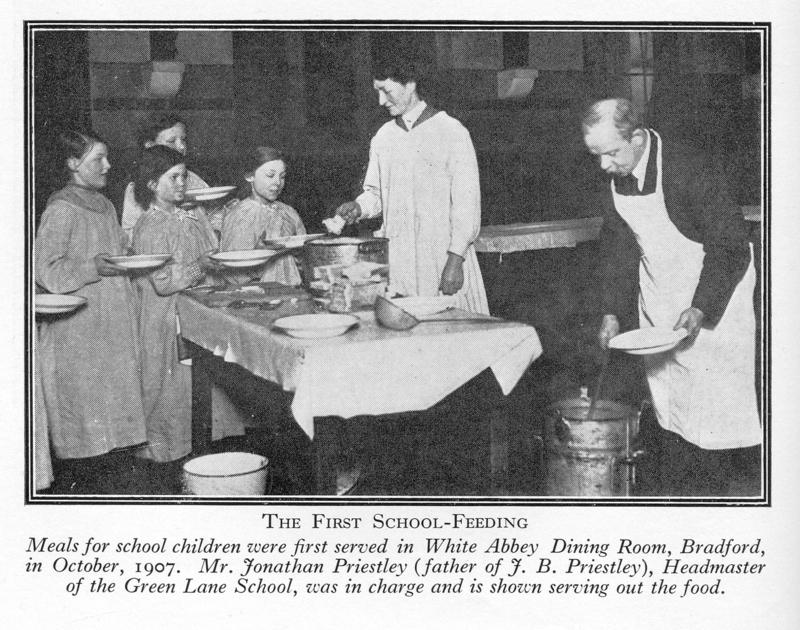 As a result of the passing of the Act, a School Meals Depot was set up at Green Lane School in 1907, supplying food to several schools in the poorest parts of the city. Our photograph shows the official opening in October 1907, which featured a meal of “scotch barley broth and fruit tart, with bread and a mug of water for each child”, Jonathan Priestley serving the broth. JBP was then aged 13 and recalled in his Preface the great local and national press interest in the story. It is fitting that Jonathan Priestley is linked with this major innovation in welfare. A conscientious Baptist, Jonathan Priestley was part of Bradford’s Nonconformist socialist scene. He came from a poor family; his father, John, was a mill worker (according to the 1881 census, a “cotton warp dresser”, the same trade as Jowett’s father). The “Priestley Family Register”, a copy of Smollett’s History of England inscribed by John Priestley, shows the harshness of their world: three of Jonathan’s siblings died in infancy. Education was Jonathan’s way out, and he believed passionately in its value. 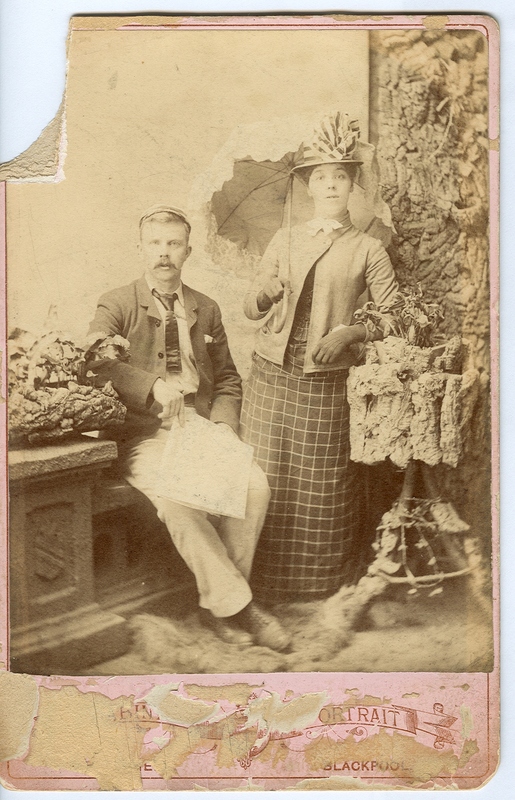 Jonathan Priestley and his wife Emma Holt, JBP’s mother, in Blackpool. Emma, who was remembered as high-spirited and witty, died when JBP was very young. Amy, Jonathan’s second wife, fortunately proved to be very kind and loving mother for the young Jack Priestley. City of Peace: Bradford’s story notably the chapter by Brenda Thomson. Writings by JB about his childhood, in particular Midnight on the Desert and Margin Released, source of above quotations. This Green Lane School web page explains and illustrates with lots of photographs the workings of the Green Lane depot. Our copy of Socialism over Sixty Years is itself an artefact. Showing the wear of much reading, it has connections to Margaret McMillan, nursery school pioneer Miriam Lord and her father ILP member Hird Lord! This entry was posted in Bradford, History, JB, Priestley, Wool Trade and tagged Bradford, Fred Jowett, Margaret McMillan, Priestley, School Dinners, Socialism, Welfare. Bookmark the permalink. A fascinating part of the history of radical progressive Bradford. 100 highlights of Special Collections at Bradford University, brought to you by Special Collections Librarian Alison Cullingford. Enter your email address to receive notifications of new objects by email.